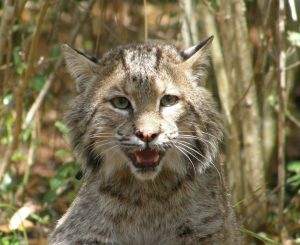 Kiawah Island is home to a healthy, stable population of bobcats. Bobcats can be seen in all parts of the island, typically during the hours from dusk to dawn. Bobcats pose no threat to humans and serve a vital role in managing populations of rats, mice, and deer on the island. Because of their vital importance to the island’s ecosystem, several research projects have been conducted to better understand their habitat needs and requirements. Bobcats are about twice the size of a house cat. Adult male bobcats weigh 18-25 pounds and adult females weigh 15-20 pounds. Their hind legs are longer and their tail is shorter than domestic cats. Bobcats are yellowish or reddish-brown and spotted or streaked with brown or black. The bobcat’s eyes are prominent and are its primary means of locating prey. Unlike other carnivores, cats have excellent binocular vision and depth perception, which makes stalking and catching prey much easier. Like the house cat, bobcats have elliptical pupils, which allow in as much or as little light as necessary. Their hearing is exceptional and they can hear even the faintest sound. Because bobcats are primarily a visual hunter, they do not have a very developed sense of smell. 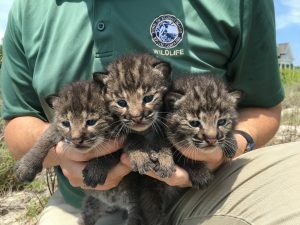 The breeding season for bobcats is February through April and kittens are born 62 days later. The den is typically located under a brush pile, in a hollow tree stump, or in a thicket of palmetto. Kittens are born blind and remain so for 10 days. They are totally dependent on the mother’s milk for four weeks, after which the female will begin to bring rodents and birds back to the den for them. The female will also teach the kittens how to hunt and kill. When the kittens are 6-8 weeks old, they will typically leave the den but remain with the female for up to a year. Bobcats are very opportunistic hunters and will eat a variety of animals, including rabbits, rodents, raccoons, birds, deer (primarily fawns during the summer), and even reptiles and amphibians. Bobcats often stalk their prey, sneaking in as close as possible before jumping to capture it. At other times, the bobcat will merely hide in an area where prey is abundant and wait for something to come along. Bobcats are at the top of the food chain on Kiawah and have very few natural enemies. Automobiles and disease are the greatest threats to bobcats, though disease is quite rare. Bobcats will live in close proximity to humans when suitable habitat is available, typically living on the fringes of development. Due to their normally secretive nature, bobcats are rarely seen. Kiawah’s bobcat population is very unique. First, there are 30-35 bobcats on Kiawah, which is more than double the typical density in mainland South Carolina. Also, Kiawah’s bobcats truly live in and amongst the people and development on Kiawah. They can be found along every single road and lot on the island at one time or another. The reason for this is that there is still ample food and cover available on Kiawah for bobcats. Current research focuses on identifying and preserving as much of their critical habitat as possible. Discourage and eliminate exotic and invasive species. Drive cautiously and watch for bobcats crossing roadways, especially during nighttime hours.